Every day, I check my bank accounts online. Every time I check, my bank is encouraging me to send it Tweets. So every day I find myself wondering whether I am the only one of their customers to find this bordering on insane. The social-media revolution has changed the way all companies do business and interact with their customers, and it would be naive to imagine that banking hadn’t been as affected as everybody else. Facebook, Twitter, Google Plus and the rest are powerful tools, enabling individuals and corporations to strengthen relationships through easy interaction – and best of all, the costs are met by somebody else. What’s not to like? Just about the only other thing I can guarantee on happening every day is that I’ll receive an email telling me that my bank account has developed some problem or other, but that help is at hand, if I’d just click on the link and resubmit my details. I’ve been getting them for the thick end of 20 years and they’ve not evolved greatly in their wit or sophistication. We all know the more obvious telltale giveaways, from the hilariously inept salutations (“Dear esteemed beneficiary…”) to the clumsily hidden address they really come from. Yet these scams still manage to fool some users – according to a 2010 report by Cyveillance [PDF], a spammer can expect to get about 250 people to hand over their data for every half-million phishing emails sent. This is a tiny fraction, but a significant number. Usually, the first thing that lets you know a purported banking email is a fraud is that it claims it comes from a bank you’ve never had an account with. But what if the scammers knew who you banked with, and took a little more care to make their emails plausible? Wouldn’t that low rate of success quickly start to climb? Every major High Street bank has a range of official Twitter accounts it uses to communicate with the outside world – often little more than a stream of links to corporate press releases or items of perceived interest to customers. But even if that’s all a bank uses Twitter for, its accounts represent an incredible intelligence-gathering opportunity for anyone willing to spend a couple of hours to better target phishing attacks. Unless you’re an avid student of the banking industry you’re unlikely to subscribe to a bank’s social-media feed if you don’t hold an account with them – and on Twitter, where you don’t even need to be a registered site user to view details of who is following a particular account, the High Street banks’ feeds are a potential scammer’s goldmine. True, a list of followers will only give you a list of Twitter account names: but, obligingly, a significant number of Twitter users include their real names on their publicly accessible profile pages, sometimes with a link to a personal website which will contain contact information: some users even include email addresses and phone numbers on those public pages. Worse – from a security perspective – most banks also operate helpline-style Twitter accounts, where users publicly out themselves as customers, often of products including mortgage, insurance and share-dealing services as well as just ordinary current accounts: and while conversations requiring detailed information are conducted via email or private Twitter direct messages, initial queries are asked and answered in full public view. In the real world, someone wishing to target you for banking fraud would either have had to have sold you something and have you give them a cheque to know where you banked, or followed you up and down the High Street on the off-chance you might visit your local branch. Following your bank on Twitter is like walking up and down that High Street wearing a t-shirt emblazoned with the name of the bank; Tweeting a question to your bank, from a Twitter account that includes your email address, is like walking around in that t-shirt, and with a flashing neon sign fixed to your head saying “Please rob me”. * Angus Batey is a freelance journalist who has covered cyber defence and data security for titles including the Sunday Telegraph and Digital Battlespace. He doesn’t follow his bank on Twitter. 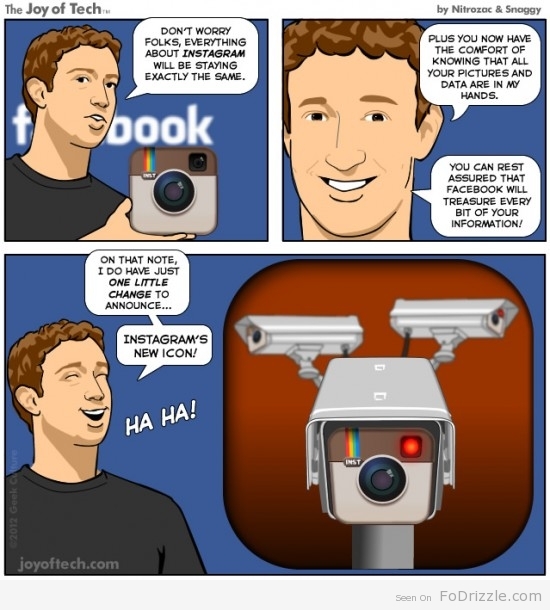 Instagram has done one thing well. And no it’s not turn HD 8MP snaps of man plus dog’s meals in to Polaroid-esque travesties of blurriness, reminiscent of ‘70s snappers. What the photo filter app-maker (or photo-sharing and social-networking service if you sign up to marketing hyperbole) has done though is highlight that there isn’t a total sense of apathy and disinterest in security and privacy amongst the greater public, they just need something to care about – a sepia-toned champion if you will. Despite what Instagram, Zuckerberg, or anyone else claims the true intention of the shift was, the subsequent backtrack was unsurprising both in its speed and scope of the policy turnaround. For a company fresh off the back of a $1bn acquisition and enjoying the associated buzz of riding the crest of the Facebook wave, the whole move was a PR disaster and the damage has already been done. If you believe some news outlets, the app has lost half of its daily user base as a result of the debacle, and competitors have stepped up to try and fill the ‘vintage filter’ void. But is it fair to blame companies like Instagram, YouTube, Facebook, et al for tying to monetise their offerings? After all they host literally petabytes of users’ content. It isn’t just servers that cost, but staff, cooling, and ground rent. And really, what were they going to use those pictures for? Which third parties were they hoping to sell them to? As nice as that shot of a sun-drenched deckchair on Brighton beach is in black and white, it’s not like stock photo repositories are going to be teeming with low-res shots of your shenanigans for sale. Let’s face it, Instagram got jealous of Facebook and LinkedIn with their user content advertising, and got caught up in the ‘we should be doing that too’ mentality that is synonymous with social media… except they forgot to offer an opt-out like those other bastions of user privacy (eventually) did. So there’s one very important lesson Instagram has given us – users care about privacy and security when they have a vested interest, if it’s something they use out of choice rather than necessity, they are more than ready to get up-in-arms about it. Well actually there are multiple lessons, but if there’s one more fortune cookie of wisdom here… It might be best to explain the purpose of a policy before rolling it out, even if it’s just for awareness, hearts, minds, and warding off mutiny. You’d have thought social media was a simple thing: the two-way conversation where everyone’s connected, everyone’s linked, everyone’s liking, and everyone’s following. It’s a global world of connectivity, nonstop chitchat, an open existence where we learn, share and grow. At a basic level, yes, that’s social media defined perfectly, but as with any explanation of this kind, it merely touches the surface. Social media is much more than sum of its parts. At first, many organisations were reluctant to be taken in by it all. They thought it was a fad, so to speak, extremely popular but transient. It’s time would pass. Everyone that took a sly little pop at it soon realised they had jumped the gun in their estimations. Everyone is now on Facebook, Twitter, LinkedIn, Tumblr and Pinterest to name the obvious few. Initially, most organisations didn’t know what to do. They were connected, but didn’t fully understand how to “talk”, to disseminate and to engage. But, with the passage of time, they refined their approach, savvied up on the particulars and, with the help of experts, cracked it. They’ve even took the time out to develop authoritative social media policies (See the BBC’s English Region’s Social Media Strategy as one example). However, this doesn’t imply that we’ve reached a level playing field. As we mentioned above, social media is a complex creature and a burgeoning one too. At RANT last night in London, Jitender Arora, chief information security officer (CISO) at GE Capital UK, discussed whether such policies are suitable. His assertion is that “pragmatic” social media governance is more effective. The obvious challenge is how one ensures that a business keeps its brand integrity intact when it publishes and engages on a macro level – a ubiquitous presence online, by virtue alone, opens them up to blunders. And these are the ones that can’t be quickly remedied for hope no one noticed. Your audience, online, is connected. They saw. One of the more serious challenges is naturally concerned with data protection. Cyber criminals, as we know, possess many means to hack into websites and security systems, big and small. The consequences of having a social network hacked are not to be underplayed as a paper two years ago postulated. Produced by the Information Systems Audit and Control Association, the study stated that the biggest threats to organisations through this conduit are viruses, brand hijacking and loss of corporate content. Which, funnily enough, brings us back to the central question: which is best, a pragmatic or following policy? Honestly, a bit of both perhaps. The UK has an “unwritten” constitution and it works; has done for many centuries. It responds and it grows. In the US they have a static constitution, which is superbly eloquent. It has been amended 27 times. Things change. The next RANT forum takes place Near Earls court in London on Wednesday 25th April 2012. For more information, visit our website.